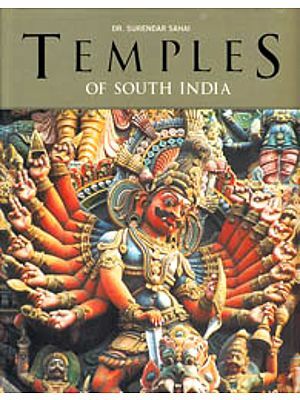 The Universe of Temples Every temple in South India is an expression of life. Stone and song, carving and composition become as one. The lord, his abode, the darbar, the steps and spaces that make the universe of the temple are the creation of the created-Man. Every great composer has been inspired by gods and goddesses-Meenakshi, Venkatesha, Tyagaraja, Varadaraja to create their great works. But behind, and even more than them, are the creative geniuses who embodied these divinities in sculpture and architecture and gave us these temples. If the puranas and itihasas, scripted as they are, seem visual, this is only because of the sculptures and paintings, the morphological equivalents and counterparts of the written word. The linguistic word, even at its elegant best is, in fact, still limited compared to colours, shapes and sounds. In fact the most beautiful words arc visual or aural. Each temple has been its own universe and one has to be inside its mind to feel its essence and allow it to bring out the beauty from our within. The Nataraja Temple in Chidambaram (p58) has been a place for great music and dance. Carnatic music compositions and the Tevaram hymns speak about the cosmic dance ‘Akasha Linga’ and theChidambara ‘secret’ (p62). Nataraja is a visual feast and hearing the temple singers or Oduvars render Tevarams in the evening by the sanctum sanctorum is a sublime experience. Once the cloth screen separating you and the elusive secret is removed, all you see is a dark, black wall and some strings of gold. But look again, and the sheer beauty of the black and little leaves of gold glimmering, is pure poetry-the poetry that nurtures music. Such moments are an artist’s dream and temples have made many such dreams a reality. Nataraja embodies the cosmic sound as much as he does the cosmic dance. A few hundred kilometres away in Srirangam (p67), the Vaishnavite deity Ranganatha reposes on his serpent. See him, if you can, early in the morning. But see him in the company of music, listening to the veena being played for his awakening. Thyagaraja’s (1767-1847) magnum opus kirtana o Rangashayi in raga Kambhoji is dedicated to the reclining Ranganatha. His consortRanganayaki inspired Muthusamy Dikshitar (1775-1835) to compose Shri Bhargavi in the raga Mangala Kaishiki. If you are in Srirangam during the festival of Raa patthu and Pagal patthu that usually occurs in the month of December you may be able to watch the Arayar sevai, a 1000-year-old artistic tradition. This is a unique way of presenting the Divyaprabandhams (Vaishnavaitc religious texts in Tamil composed by the Azhwars) using a tuneful rendition of its verses and the capturing of its meaning through abhinaya by the Arayars, who are all male performers. In a little Narasirnha temple in a small village called Melattur in Thanjavur (p74), we can still witness the presentation of Bhagavata Mela-a theatrical presentation including drama, dance and music. This festival is held around the month of May every year. The beautiful gods and goddesses of every temple in Thanjavur cannot bc forgotten for the music they have given us. The singular deity Kamakshi of the Kamakshi Amman Temple gave enough reason for Shyarna Shastri (1762-1827) to cry out to her, describe her and cajole her in the most elegant musical offerings that one can ever imagine. Not very far away Rajaraja. Chola (10th-11th CE) gave us Brihadeswarar, who stands in his most naked, most real state - lingam to touch the chords of the imagination. Go further south in Tamil Nadu and you will hear the seven swaras when you strike some of the pillars in the Nellaiappar Temple in Tirunelveli and the Sthanumalayan Temple in Suchindram (p103). The basic building blocks of music were placed within the pillars of support. Here music is given a tangible form within architecture. You may not hear a song from the pillars, but you will feel the energy of sound, which man absorbed to give life to music. Having travelled close to the Kerala borders, let us not forget the handsome lord of Thiruvananthapuram - Padmanabhaswamy - who inspired the king composer Swathi Thirunal (p136). A single look at him and you know why. During Navaratri, you shouldn’t miss the concerts held at the Navaratri Mantapam, adjacent to the temple. I can never forget the Krishnattam (p166), another religious artistic tradition that I witnessed in Guruvayur (p164), during a late night visit. The other Krishna, who is petite and reveals himself only through a window lives in Udupi (pI88). No one needs to have seen him but you will feel him and sense him every time you hear the composition Krishna ni begane baro. Near the Vithala Temple in Hampi (Karnataka) you will see the Purandaradasa Mantapa. Did Purandaradasa (1484-1564) sit there and compose? Maybe he did, maybe he did not. We need not ask these questions, as they are irrelevant. Purandaradasa created great music and took in all the beauty he saw and touched at every temple he visited or even heard about. The stories that grew around Krishna or any other deity were reflections of innermost human experiences transferred onto the tangible image. Music drew even more from this. As the performing musicians, poets and composers beheld Krishna not just with their eyes but with visionary genius, they carried those precious moments, from the mundane to the ethereal.